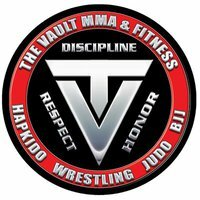 Training at The Vault MMA and Fitness in Monrovia California | MMA Fighting Events Videos Techniques UFC Fight Picks and News. I was supposed to be there for the 5:30 Hapkido class. I'm a teacher and I missed out on that class because I waited for an hour for a parent/teacher conference and the parent never showed up…but I'm not upset. Anyway, I was able to make it on time for the 6:30 class. On Wednesdays, The Vault has Muay Thai. I got out of my teacher's clothes, wrapped my hands, and jumped into class. Frank, The Vault's Muay Thai instructor, had us doing a basic warm-up. We jogged around the mat, did some assorted calisthenics, and worked on some basic combinations as we worked around the mat. THEN…he had the room complaining. If you've ever done mma training, you know what I mean. Frank had us doing some sadistic set of pushups. "If you don't learn any Muay Thai from me, you'll at least be stronger," Frank shouted as he pushed out the pushups himself. After the "warm-up", we got down to Muay Thai business. Frank worked on some kicks with class. There were quite a few beginners that night, so Frank decided to work on teeps and front round kicks. Frank demonstrated what he wanted everyone to do then did a good job of walking around and helping students improve their form. At 7:30, it was time for ground work. Rod was in charge of teaching Brazilian Jiu Jitsu (BJJ). Rod had everyone warm-up (there were some students left over from the Muay Thai class and some students that showed up only for the BJJ class). The warm-up was not as sadistic as Frank's, but it did include squats and dive bomber pushups. Since the class is a BJJ class, most students had their gi. However, Rod did accommodate those of us that did not have a gi. We all worked on getting into the spider guard position as well as not allowing our opponents to pass. I've never trained much bjj. Needless to say, my fingers are still a bit sore. At the end of class, we all got to free roll. Rod pretty much let us stay and practice until we chose to leave. Thanks to The Vault, Vince, Rod and Frank for allowing me to go check out their training facility and training methods.